Garret Fisher was just 22 when he qualified for his first CrossFit Games appearance in 2013, yet he already had seven years of CrossFit experience: he started CrossFit in 2007 at 15 to improve his fitness for baseball. In 2013, he became an overnight celebrity after taking fifth in his rookie Games performance, fans taking note of his imperturbably coiffed hair, and after the season was done, became rapper Rick Ross’ personal trainer. 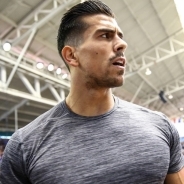 After a two-year gap in which he failed to qualify for the Games again, he returned to take a 20th-place finish in 2016 (Fisher’s sister Lauren also competed individually that year). Fisher currently serves on the CrossFit Level 1 Seminar Staff.